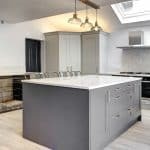 The kitchen in Abby and Graham’s Victorian semi-detached home had already been extended to the side of the property, so although there was plenty of space, the couple felt they couldn’t really use the area the way they wanted to. They needed more space and the kitchen needed better lighting, as despite having bi-fold doors out to the garden, the only other natural light was from a small Velux window. 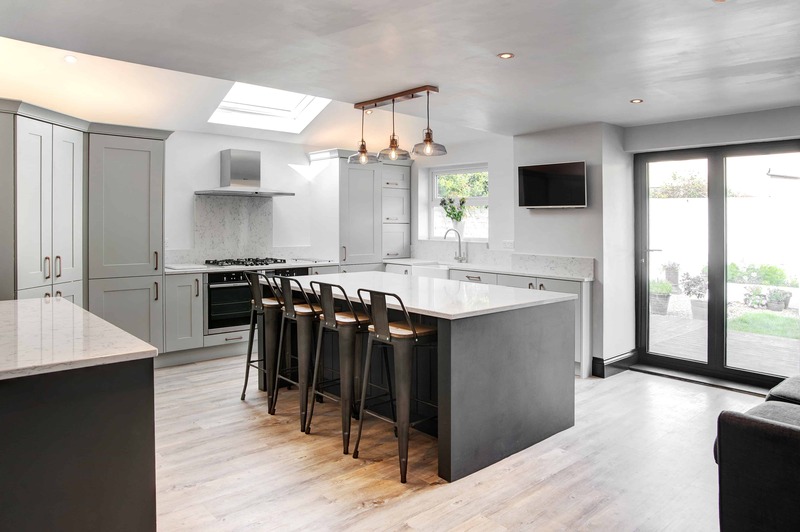 To open the kitchen area by utilising the space, remove the archway that limited the flexibility of the room and made entertaining and socialising difficult, and to add a bigger Velux window to increase the natural light into the area. By the time we visited Court Homemakers we had a very good idea of what we wanted. Court Homemakers understood what we wanted and the ideas we had in our minds and set about delivering that, making suggestions that enhanced our ideas along the way. What style kitchen did you want? We wanted a Shaker-style kitchen in grey. The cupboards are Partridge Grey, while the island feature which now replaces the arch is Graphite. We went for two individual Neff Slide and Hide ovens with a 5-ring hob. What are the standout features and why? There are two for us. The centre island and the storage and seating area that it offers, and then the lovely walk-in larder which we spotted in the Court Homemakers showroom. It did have to be built to fit, but Court Homemakers were able to deliver the bespoke piece in their workshop. 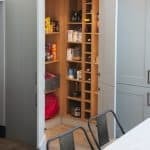 We love the tall double doors with shelves on both sides, the lighting and the wine rack. Not really, but we do have two dogs and their den has been seamlessly incorporated into the design. Their home now fits into one of the workspace areas, which maximises the space that’s available for us to use. Why were Court Homemakers chosen to do the job? 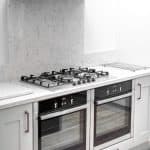 We had our own builder, but we knew Court Homemakers could do everything else for us including the electrics and plastering – the service was exemplary from beginning to end. The after sales team made sure everything was sorted before the job was finished, and best of all, we didn’t feel as though we were paying any extra for this level of service. The price of the kitchen was definitely comparable with the other outlets we’d visited.